(FIGS. 1.33, 1.34). The imprint will show all the surface details of the compression, such as leaf shape and venation, but there is no actual plant material, that is no carbon, preserved. If you have ever seen a leaf imprint in a concrete sidewalk, you have seen an impression. 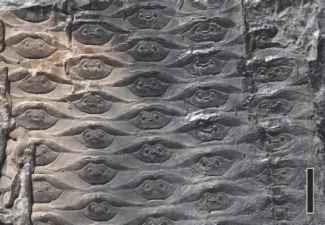 The process involved in the formation of an impression is also analogous to these modern "fossils." Such imprints are formed when leaves fall and settle into the wet concrete just after it is poured. As the concrete hardens, it conforms to the contours of the lower side of the leaf that rests on it. Eventually, the leaf disintegrates and the pieces are blown away, but a negative replica of the leaf remains on the hardened concrete. If you have ever put your initials in wet concrete, you have formed an impression. The impression of dinosaur footprints represents an excellent example of this type of fossilization process. When several footprints are of the same type or a series of trackways are discovered in close proximity, it may be possible to extrapolate the stride of the organism and, from this, infer something of the biomechanics of the animal. 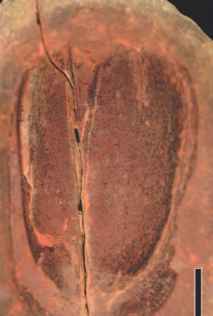 FIGURE 1.35 Cast of large seed fern seed (Pennsylvanian). Bar = 2 cm. activities of microorganisms during the decay process. Regardless of their origin, however, the mineral crust may provide an excellent replica of the surface of the plant part, and this can be studied using a variety of imaging modes.